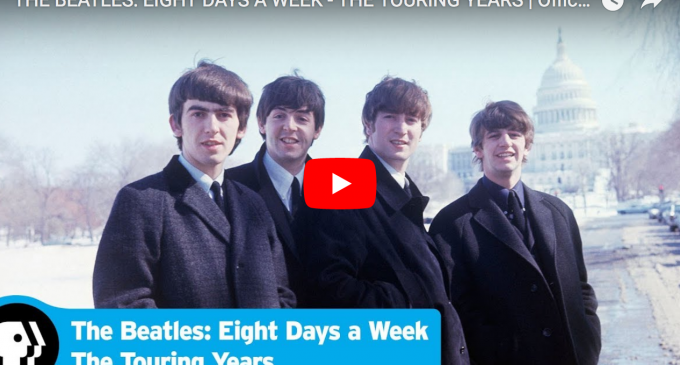 For those of us who weren’t lucky enough to attend a Beatles concert in the 1960s, Ron Howard’s Eight Days a Week just might be the next best thing. The 2016 documentary traces the band’s rise from a cramped and dank cellar in Liverpool to record breaking television appearances, jam packed stadiums, and—ultimately—rock immortality. Lovingly assembled through rare and often unseen fan home movie footage, Howard’s film also draws on more familiar material—restored to the highest echelons of HD— and new interviews with Paul McCartney and Ringo Starr. All told, it’s a joyous and stunningly visual representation of their unbelievable journey, and an unparalleled look at a time when the four Fabs roamed the Earth and made themselves available to see, live and in person, for just a few dollars. Though hardly the first gig at their unofficial home base on Liverpool’s Mathew Street—it was actually their 218th session in the former fruit cellar—this set marks the group’s first ever television appearance. A camera crew from Grenada Television, a Manchester-based regional network, captured the band plowing through two takes of Richie Barrett’s latest R&B stomper, “Some Other Guy.” Extra stage lights were needed to provide suitable illumination in the subterranean venue, adding to the already sweltering summer heat. “It was really hot and we were asked to dress up properly,” George Harrison recalled in the Beatles Anthology documentary project. “We had shirts, and ties and little black pullovers. So we looked quite smart…It was big-time, a TV-company-coming-to-film-us excitement.” John Lennon might have had another cause for his excitement—he was scheduled to marry his girlfriend Cynthia Powell the following day. Initially filmed for the Know the North program, the grainy footage was deemed substandard for broadcast and shelved until the following year—by which point everything the Beatles touched became a surefire ratings draw. While its cameraman, the future documentarian Leslie Woodhead, later described the lo-fi film as looking “like something smuggled out of Eastern Europe,” its historical significance more than makes up for its questionable quality. The clip is the first moving image of the Beatles with synced sound, the first video with Starr, and the only film ever made of them performing at the Cavern. However, it was the crowd outside that made the headlines. Several hundred fans began converging earlier that afternoon, but by the end of the performance the venue had been swarmed by over 1,000 teenagers, whipped into a frenzy at the mere chance of seeing their musical idols. “Screaming girls launched themselves against the police—sending helmets flying and constables reeling,” read one account in the Daily Herald. The press soon came up with a new word for this strange phenomenon that had its grip on the nation’s youths: Beatlemania. Yes, the Beatles’ debut appearance on The Ed Sullivan Show two days before completely changed history and its impact on popular culture reverberates to this day. Close your eyes and think of the Beatles, and chances are you will see them in stark black and white, launching into “All My Loving” before an live audience of just 728 in CBS Studio 50 on New York City’s Great White Way—and 74,000,000 elsewhere, watching on television screens across the country. It was the performance that launched a thousand bands and invented a new generation of teenagers. It would get worse. Performing “in the round” meant that they were only facing a quarter of the audience at any moment. The awkward solution was for the band to stop every third song and shift their equipment 90-degrees clockwise, which worked as well as could be expected until Starr’s drum riser got stuck. The Beatles’ trusty—and enormous—roadie, Mal Evans, was called upon to save the day. Despite the challenges, they rose to the occasion, giving their all in the land that had inspired them to make rock ‘n’ roll. Nicol was to play one more role in the Beatles’ story. McCartney never forget his pet phrase, “It’s getting better!”—usually uttered in reference to his drumming. In the spring of 1967, he wrote a song around the optimistic expression, becoming the third track on Sgt. Pepper’s Lonely Hearts Club Band. When the Beatles returned to the United States for their first full scale tour later that summer, they aimed to document the trek with a (highly lucrative) live album. Plans to record their set at New York City’s Carnegie Hall the previous February had fallen through due to problems with the American Federation of Musicians, so this time around they set their sights on an even glitzier venue: the Hollywood Bowl. All 18,700 seats at the iconic art deco amphitheater had sold out soon after going on sale, thus guaranteeing an electrifying display of Beatlemania, California style. The band took to the stage at 9:30 p.m., playing 12 songs over the course of half an hour before speeding off in a chauffeur-driven car. The experience was less pleasant for Martin, who was on hand with Capitol Records producer Voyle Gilmore to oversee the recording process. While the music sounded fine, it was completely overpowered by the screams from the audience. “It was like putting a microphone at the tail of a 747 jet. It was one continual screaming sound, and it was very difficult to get a good recording.” They made a second attempt when the band played the venue on their American tour the following year, but they encountered the same technical problems. The Beatles would be one of the few major acts if the era who didn’t release a live album in the ‘60s. More than a decade later, technological advances allowed the tapes to be sufficiently sweetened and they finally saw release as The Beatles at the Hollywood Bowl in 1977. After going out of print for many years, a remixed, remastered, and expanded version of the album was issued in 2016 to correspond to the premiere of Eight Days a Week. A flimsily stage was constructed just over second base, putting a seemingly insurmountable distance between the band and the crowd—which included future Beatle wives Linda McCartney (then Eastman) and Barbara Bach. (“I was shocked!” Starr recently told PEOPLE of this remarkable coincidence. “Who knew?”) For safety’s sake, the field was lined with a phalanx of NYPD officers and wooden barricades. After being transported from Manhattan to the roof of a World’s Fair office building in nearby Flushing, the Beatles were shuttled into the stadium via Walls Fargo armored van. After closing 1965 with a short tour of the United Kingdom—ultimately the last in their homeland—the Beatles began to rethink their priorities. “By the end of 1965, the touring started to hit everybody,” says Starr. “I remember we had a meeting during which we all talked about how the musicianship was going downhill, never mind the boredom of doing it.” On their only trek through Japan the following June, an extensive security personnel (some 3,000 police for 10,000 fans) enforced strict silence among the crowds in Tokyo’s Budokan, rendering the Beatles’ rusty performance audible for the first time in years. “The band suddenly realized they were out of tune and they had to get their act together,” remembered their road manager (and future Apple Records President) Neil Aspinall. But no event cemented their distaste for touring quite like their trip to the Philippines in July 1966. Ferdinand Marcos’ repressive regime made its brute strength known from the moment the Beatles’ plane touched down at Manila International Airport. “As soon as we go there it was bad news,” remembered Harrison. “There were tough guerillas—little men—who had short sleeved shirts and acted very menacingly.” Starr, who later unequivocally said that he “hated” the experience, remembered “everyone had guns and it was really like that hot/gun/Spanish Inquisition attitude.” They were forcibly taken onto a yacht owned by a wealthy local business man, where they were held as “guests of honor” until 4 a.m. The Marcos’ were also pretty cheesed off when the group was a no-show at the lunch party. The entire country seemingly turned against them as the morning papers screamed “BEATLES SNUB FIRST FAMILY.” Security detail was withdrawn, and the band were forced to find their own way back to the airport to catch their departing flight. Lugging their own guitars and equipment, they braved through a furious crowd of shouting and spitting citizens hellbent on roughing up some Beatles. They made it through the melee with maximum difficulty, but their plane was forbidden to take off until the group handed over a great deal of money in “taxes.” Fearing that they’d wind up in prison as enemies of the state, they paid up. “Strangely enough, I think it came to the same amount as the receipts for the trip,” McCartney later said. The prospect of going out on the road again just over a month later did not exactly appeal to any of the Beatles. “We’re going to have a couple of weeks to recuperate before we go and get beaten up by the Americans,” Harrison sarcastically told one reporter. It would prove scarily accurate. While the remark passed unnoticed in the U.K., it ignited a firestorm south of the Mason-Dixon line. The Beatles’ music was boycotted, their albums were burned—along with crosses—and their concerts were picketed by Klansmen making unsubtle death threats. Their show in Memphis was irrupted by a loud bang that reverberated through the auditorium. “Every one of us … look[ed] at each other,” Lennon remembered, “because each of us thought the other had been shot. It was that bad.” It was just a cherry bomb, thrown as a prank by some kids, but the fresh bullet holes in the fuselage of their plane were no joke. The problems continued days later when Biblical rains drenched several open-air concerts. The Beatles rescheduled one, risking a riot in the process, but gamely played another, making due with the sparks flying off their soaked electrical equipment. Mal Evans was tasked with unplugging the main AC connection as soon as the first Beatle collapsed from electric shock, but thankfully that was never necessary. Just before taking the stage, McCartney asked Tony Barrow a favor. “I remember Paul, casually, at the very last minute saying, ‘Have you got your cassette recorder with you?’ I said, ‘Yes, of course.’ Paul then said, ‘Tape it, will you? Tape the show.’” True to his word, Barrow held his recorder aloft, capturing everything up to McCartney’s mumbled final stage announcement. “We’d like to ask you to join in and, er, clap, sing, talk, do anything. Anyway, the song is … good night.” He makes up for his lack of enthusiasm by summoning an unholy shriek to kick off the band’s closer, Little Richard’s “Long Tall Sally.” It’s a song that had been in the Beatles’ repertoire since their earliest shows in 1960, and it was still clearly a favorite. For a single verse the band can be heard giving it all they have—more for themselves than for anyone else. No one in the crowd can hear them anyway. Then the tape runs out. Cassettes only held 30-minutes per side in 1966—a technical quirk that robbed history of the very last strains from a live Beatles concert. But in the end, maybe it’s best to remember them playing. From the Palladium gig onwards, nearly all of the Beatles concerts were drowned out by the screams of adoring fans. One rare exception is this set for Swedish radio, during which the band blows through seven songs with all the force of a cyclone. Recorded for Klas Burling’s Sveriges Radio (Swedish National Radio) show Pop ’63, the audience consisted of 100 lucky winners of a ticket giveaway. The Beatles blast off with a particularly explosive version of “I Saw Her Standing There,” offering perhaps the best glimpse of the band’s rough and raw days as a nocturnal bar band on in the Red Light District of Hamburg, Germany, less than a year earlier. Forgoing a rehearsal, and even a sound check, their cranked up guitars pushed the radio sound meters into the red zone. The distorted sound horrified engineer Hans Westman, who called it “the worst recording I’ve ever made.” The Beatles, on the other hand, loved it.